A press conference called Demolition Day took place at the Vallco mall’s former AMC Theatres lobby. Will pieces of Vallco Mall vanish over the next year? That’s the word from mall ownership and some elected representatives who attended a press conference called Demolition Day on Thursday at the mall’s former AMC movie theater lobby. Sand Hill Property Company officials spoke about how they will eventually dismantle pieces of the mall and redesign it into a destination with office, housing, open space and shopping components. Demolition began with heavy machinery chiseling off a portion of an empty parking garage on the west side of the mall. The ceremonial destruction is the first step towards changing the mall site into a new town center-style development, the company says. The press conference saw remarks from Reed Moulds, Sand Hill’s Managing Director; Peter Pau, Principal and Co-Founder of Sand Hill; State Senator Scott Wiener; State Senator Jim Beall; Assemblymember Evan Low; Santa Clara County Supervisor Cindy Chavez; Cupertino Vice Mayor Rod Sinks and Cupertino Councilmember Savita Vaidhyanathan. The mall owners got final approval from the City of Cupertino on September 21 to move forward with its SB35-fueled project application, Vallco Town Center, which if built would bring 1.81 million square feet of office space, 400,000 square feet of retail and 2,402 additional housing units to Cupertino. Half of those homes would be affordable housing. The project, would include a 30-acre rooftop park, town center plazas, and a shopping, dining and entertainment district, according to Sand Hill. On September 19, the City Council voted 3-2 to accept an alternate proposal, the Vallco Specific Plan, which puts in place the necessary zoning and development rules for the property owner to propose a similar project with retail, office, housing and open space. The Specific Plan allows for construction of 2,668 housing units, 20% of which would be set as affordable units. It’s unclear which project will be built. Both projects were alluded to at the October 11 event. There was talk about the fast-track nature of the SB35 legislation and how it was written to emphasize affordable housing. Sand Hill said their project was the first such to get approval under the new legislation. 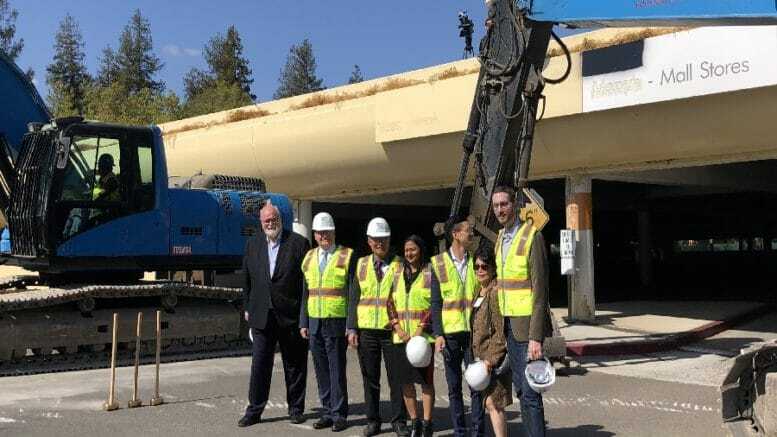 “No matter what, the end results of this will be a vibrant town center for Cupertino, and one that alleviates the region’s housing crisis, and Cupertino’s own dire affordable housing crisis,” said Moulds. “This city just approved a plan that envisions nearly 3,000 units, nearly 10 times the plan from just three years ago. Both approvals are great news for Cupertino, and a win-win in an effort to do right by itself and its region,” he added. Senator Wiener crafted SB35 and it was approved last year. Wiener had plenty to say about the need for more housing at the press event. Councilmember Vaidhyanathan was one of the last dignitaries to speak. She quoted a famous Cupertino icon about the impact a new Vallco could have on her city. Despite all the celebration at the event, a group in opposition to the Specific Plan earlier this month announced they plan to try and overturn it through voter referendum. There’s a signature-gathering drive underway to halt that plan. The SB35 project, however can’t be challenged at the ballot box, according to the “Revitalize Vallco” website. Unlike the SB35 project, which had no approval from the Council, the Specific Plan requires the property owner to give nearly $280 million in “community benefits” for traffic, school and city uses, including 40 Extremely Low Income housing units for the developmentally disabled and an additional $4.75 million to the Cupertino Union School District. There are also plans for a new city hall and emergency response center at the civic center, a performing arts theater, an adult school, traffic improvements and a community shuttle program. Sand Hill said at council meeting last month that attempts to tie the Specific Plan up with litigation or flat out kill it through referendum would ultimately make the SB35 project more viable. The company says their project is now “fully entitled” and construction could begin in the not-too-distant future. According to the City of Cupertino, Sand Hill has permits now to demolish some of the parking structures near the old Sears building. This work is the first phase in the demolition process, with other portions of the mall slated for the next phase in early 2019. Be the first to comment on "Demolition at Vallco Mall has begun"